Flower: 1/4" to 1/2". 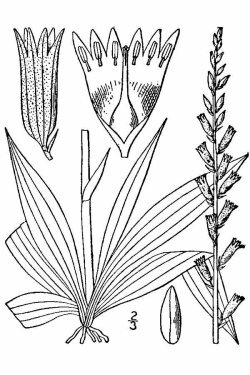 Flowers are sessile or short peduncle, white, bell-shaped, oblong, urns sometimes tinged with yellow and grow along the top of the long stem or spiked raceme. Flowering time: mid-June to late July. Fruit is ovate capsule with many fleshy and oily seeds. Habitat: Grassy or sandy woodlands, in dry or moist peats, sands and gravels; light (sandy) and medium (loamy) soils, well-drained. The plant prefers acid soils and can grow in very acid soil. It cannot grow in the shade. It requires moist soil. Range in New Jersey: Casually in the northern counties in sandy ground and in Witmer Stone's time, "common throughout our limits". Found in the Middle District, the Pine Barrens, the Coast strip, and Cape May. Misc. 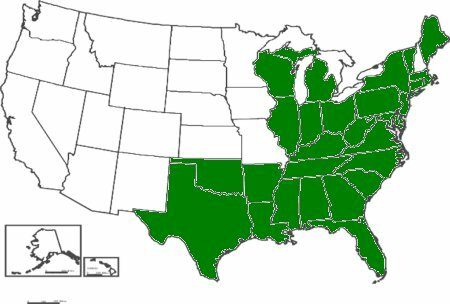 USDA lists as FAC (facultative):equally likely to occur in wetlands (estimated probability 34% - 66%) or non-wetlands. 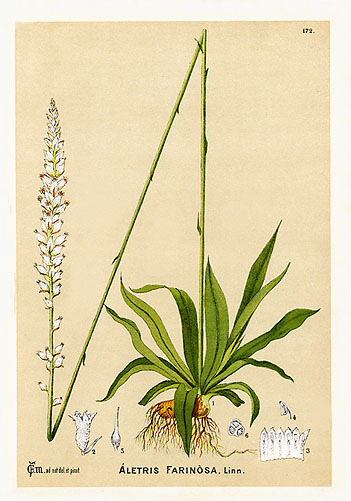 Witmer Stone, 1911, notes: "There is a form of this plant with shorter leaves and shorter, more nearly spherical flowers found especially near the 'plains', but the differences do not seem sufficiently well marked or constant to warrant separation. While certainly not A. aurea, this plant seems to have been the basis for the inclusion of that species in Britton's Catalogue; the Rusby plant referred to was in fruit and its identity was not clearly determined. Pursh, who reported A. aurea fromNew Jersey, may have had the same form in mind." In folklore, Aletris was considered a sacred female medicine to many native tribes. It was used in some tribes to introduce young girls into womanhood. Also used to induce visions due to its narcotic properties. 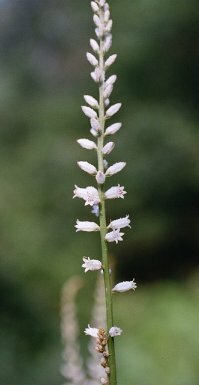 It has been used as a cure for habitual miscarriages, and treatment of rheumatism and jaundice, as well as colic (hence the name colicroot). Aletris, Greek word meaning to grind (Aletris was a female slave who grinds the meal); the name refers to the powdered appearance of the herbs; farinosa, Mealy or powdery--referring to the perianth, which is roughened with numerous short, scale-like points, giving it a mealy appearance.